FREMONT, Calif. – Intematix, a leading innovator of patented phosphors and phosphor components for high-quality LED lighting, today announced the release of the Ruby series of red nitride phosphors that enable exceptional efficacy, color rendering and reliability for high-power LEDs. 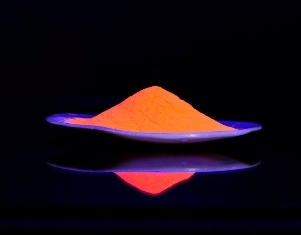 These unique phosphors, backed by Intematix U.S. patent No. 8,274,215, are ideal for applications like general lighting and backlighting for LCD TVs. Red nitride phosphors fill crucial gaps in the color spectrum and create quality light in the most demanding applications. Intematix red nitrides in combination with Intematix GAL phosphor enable near-perfect color rendering up to 98 CRI. Intematix red nitrides used in blends with GAL phosphors also enable 100 lm/W efficacy in warm white packages. Intematix’s U.S. Patent No. 8,274,215 is the 18th U.S. patent issued to Intematix in the area of LED phosphors and the 71st U.S Patent overall. Intematix also has over 300 pending patent applications covering LED phosphor and lighting technologies on a world-wide basis. The Ruby series expands the company’s wide range of phosphors, adding to its extensive portfolio of nitride, silicate, aluminate, and garnet phosphors. For more information on Intematix phosphors and intellectual property please visit www.intematix.com.